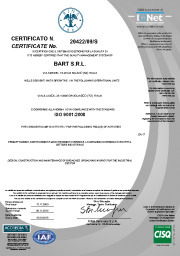 For over forty years, BART takes care of broaches and broaching, in Italy one of the leaders in the field of precision mechanics, is certified ISO 9001/2008. We are able to respond quickly and effectively, the highest levels of competence and professionalism, the most varied and complex demands in the field of broaching in General and the design and construction also helical broaches, and specials. We are the only ones capable of producing broaches in just 30 days, ensuring maximum precision and low tolerances (up to 0.005). We also have a vast and varied stock broaches (catalog is available online at our website), which allows an immediate availability of broaches and service contractors. For over forty years, BART takes care of broaches and broaching, in Italy one of the leaders in the field of precision mechanics, is certified ISO 9001/2008. We are able to respond quickly and effectively, the highest levels of competence and professionalism, the most varied and complex demands in the field of broaching in General and the design and construction also helical broaches, and specials. We are the only ones capable of producing broaches in just 30 days, ensuring maximum precision and low tolerances (up to 0.005). We also have a vast and varied stock broaches (catalog is available online at our website), which allows an immediate availability of broaches and service contractors. На протяжении более сорока лет, Барт заботится о протяжки и протяжные, в Италии, один из лидеров в области механики точности, является сертификат ISO 9001/2008. Мы способны быстро и эффективно реагировать, высокий уровень компетенции и профессионализма, самых разнообразных и сложных требования в области протягивания в целом и разработки и строительства также винтовой протяжек и спец. Мы единственные, способные производить протяжки в только 30 дней, обеспечения максимальной точности и низкие допуски (до 0,005). У нас также есть огромный и разнообразный запасов протяжки (каталог доступен онлайн на нашем сайте), который позволяет немедленной доступности протяжки и услуги подрядчиков. Da oltre quarant'anni BART si occupa di brocce e brocciatura, collocandosi in Italia tra i leader del settore della meccanica di precisione, è certificata ISO 9001/2008. Siamo in grado di rispondere velocemente e con efficacia, altissimi livelli di competenza e professionalità, alle più svariate e complesse richieste nel campo della brocciatura in genere e della progettazione e costruzione brocce, anche elicoidali e speciali. Siamo gli unici in grado di produrre brocce in soli 30 giorni, garantendo massima precisione e tolleranze bassissime (fino a 0,005). Abbiamo anche un vasto e variegato magazzino brocce (il catalogo è disponibile on-line sul nostro sito), che permette una disponibilità immediata di brocce e il servizio conto terzi.